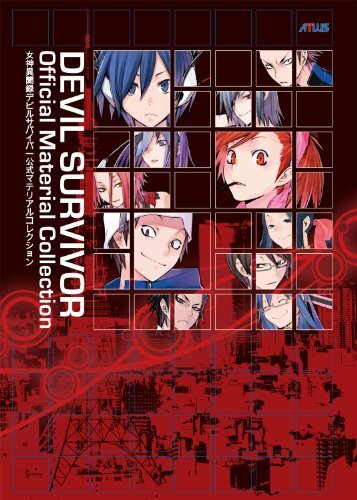 This is the concept artbook and video game visual companion to Shin Megami Tensei: Devil Survivor (女神異聞録:デビルサバイバ). The original is the Japanese edition 女神異聞録デビルサバイバー 公式マテリアルコレクション that was published in 2009. Udon translated this English edition. The book's a large 176-page paperback. The first part looks at the characters, the art as they appear in the game, and also the concept sketches and profile. There are bits of interesting information on the dynamics between characters that make for an interesting but brief read. Mail data from selected characters are included. The second part is the demon compendium. This section has the demons' description and the quotes when they are recruited from the Devil Auction, or when fusing. Unfortunately, there's no art in this section. The demons are just game screenshots printed rather small. It's a waste because their designs are more interesting than the human characters. The next section has the environment art which are game screenshots. It shows several icon places in Japan as adapted for the game. Included is a small photo reference from real life, followed by the game art, and of the places in different phases of contamination. The text talks about the different events that happen there. Since it's game screenshots, the resolution isn't that great which is why they aren't printed that big. The last part has more miscellaneous art such as storyboards, cutscenes. It ends with an interview with the creators, namely director Shinjiro Takada, scenario writer Yoh Haduki, art director Akiko Kotoh and character designer Suzuhito Yasuda. As a game companion, it provides insight especially to the design of the game and characters. It could have been a better book with demon concept art added, and source graphic files for the environment.